not all “Brits” poke fun at Napoleon, I have followed his career since buying “The Anatomy of Glory” in the early 1970’s. It’s time to stop this nonsense, come and speak to the thousands of wargamers, modellers and members of the “Napoleonic Assoc” who do so much to promote the study of this historical period in Britain. What’s need in our research is balance not childish name calling and finger pointing on either side. Ca ira! Hi, probably a late reply, what is wrong with any view,none of us needs to agree with it unless we do. I am a newbie to the napoleon podcast, and as an Englishman, I consider myself lucky to be able to listen to two passionate individuals give their view on an individual who in my opinion is one of the great characters in history. On a subjective note, in my opinion, even Hitler/Stalin/Genghis khan could be considered to have had some good points? Regards to all who in a free democratic society have the right to debate and express their views. With the seal applied, the letter was set to be delivered the following day. But since nothing on the island was ever simple, when the letter arrived at Plantation House for forwarding, the Governor returned it to sender, in strict accordance with the island rule that only open letters could be delivered to correspondents, in this case, Las Cases. not present, he must have this information at second hand. and gave the letter back to the British officer, Poppleton, who the same day re-delivered it to the Governor. 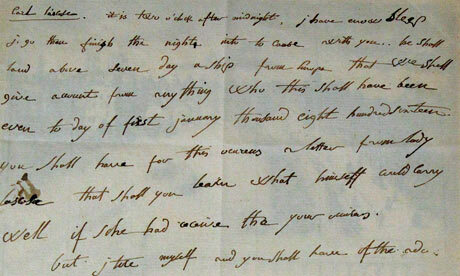 Hudson Lowe was therefore able to see the content of the letter before supposedly forwarding it to his prisoner. Was the Governor offended by the contents, as Napoleon hoped, and as Las Cases claimed? Whatever, the answer, Lowe sat on the letter, only delivering it to Las Cases late in the day on Monday 16 December, two full days after having received it.